Product totals 240g (20g × 12 pieces). 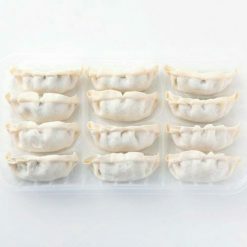 Enjoy the juicy Gyozas quickly! Sugarlady’s Gyozas are filled with plenty of meat and vegetables, and they are big on taste and flavor. Domestically grown, non-GMO cabbage and leeks used were processed within 3 days after harvest, so you can rest assured that you are putting a great dish for the entire family. 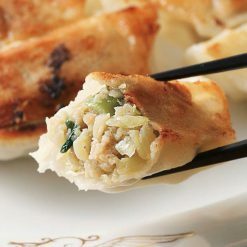 Our gyoza contains garlic and ginger, which are the unsung heroes of this Chinese dim-sum dish. Garlic and ginger are known to have many medicinal benefits, such as lowering of cholesterol level, improving blood flow and immune system, fighting virus/bacteria, and many others. 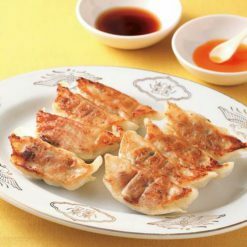 To prepare Sugarlady’s Gyoza, spread 1 tablespoon of cooking oil to the heated frying pan, and place them frozen. There is no need to defrost. When using the fluorine-processed frying pan (Teflon), oil is not required. Add about 130ml of water so that the bottom of Gyoza is immersed. Place a lid on the pan to steam for about 5 minutes over medium heat. When almost all the water is gone, turn down the heat and add 1 teaspoon of oil (or sesame oil for extra flavor) and let it spread over the entire pan. Cook about 2 more minutes, and when the bottom of the dumplings are brown and crispy, enjoy with some sauce mixture of soy sauce, vinegar and, a dash of chili oil and/or Yuzu Kosho (citrus chili paste) for those who like them with a little kick. This product contains vegetables (cabbage (domestic), leek, garlic, ginger), pork (domestic), lard, granular soy protein, soy sauce, sake, sesame oil, yeast extract, salt, black pepper, gyoza skin (flour, wheat protein, maltose, sodium chloride). This product is not suitable for anyone with allergies to wheat, soy, pork or sesame and may be cross-contaminated with other allergens. Origin of ingredients: cabbage, pork, pork fat (domestic) Prepared and packaged in Japan.